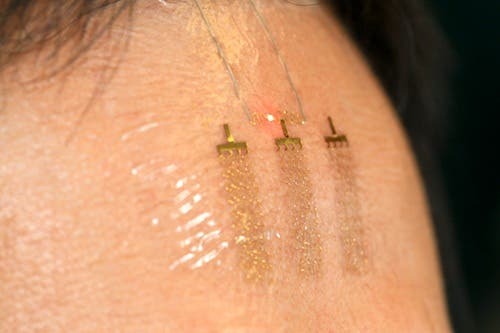 An epidermic flexible electronic device applied on the forehead. The device can read brain waves and transcode these into actions. John A. Rogers. It’s remarkable what state technology has reached today, and it’s only getting faster, more powerful and smaller. If merely a decade ago you were to tell someone that it would be possible for a human to control a robotic arm by the power of thought only, chances are you would have been labeled as mad. Today, not only has this become a reality, but researchers are pushing their limits even further. Todd Coleman and colleagues at the University of California at San Diego for instance are working with flexible electronic “tattoos” that when applied to the forehead of the bearer can translate brain waves into actions – like flying a drone or talk without speaking or typing in an almost telepathic manner via smartphones. It’s remarkable how scientists today have managed to achieve with brain interface technology. Moving objects and controlling remote machinery simply by the power of thought is mind-boggling. However, typically this requires the bearer to have electrodes and other devices implanted in the brain. This is why the technology has been exclusively used for now only for medical purposes. People with motor disabilities or who are completely paralyzed have a great deal to benefit and are willing to take on the risks associate with surgery. Pushing the barrier and breaching this technology to healthy humans is the next step through non-invasive technology such as the one currently in development at Sand Diego. 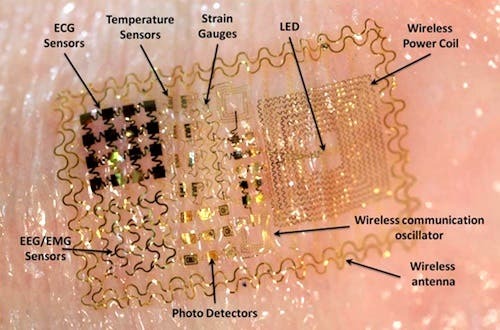 Their device is extremely flexible and has a slew of miniature components, like antennas, sensors and wireless transmitters, all tucked in a sheet only 100 microns thick – roughly the width of a human hair. The circuitry is all embedded in a rubber polymer that allows the system to stretch with the skin without causing damage, all while barely being visible. Coleman and his team have previously developed a cap studded with electrodes which a wearer used to fly an unmanned airplane. The tiny flexible tattoos still have a long way until they can reach this kind of performance, but the researchers found them effective in recognizing brain wave patterns that reflect various mental states – like recognition of a familiar image. In time, the researchers are confident they can achieve the same results currently obtained with brain implants. They also claim they can upgrade the system to provide a wide array of additional features, like thermal sensors to monitor skin temperature and light detectors to analyze blood oxygen levels. The concept of artificial telepathy is also seriously discussed. Previously, scientists have found that when we think about talking, the throat muscles move even though we aren’t speaking – something known as subvocalization. The device could be placed on the throat and therefore behave as a subvocal microphone through which people could communicate silently and wirelessly.